In which the seemingly impossible becomes possible. Forgive me for posting so much about robotics and so little about education in general. It’s what I’m most excited about at the moment (the excitement is contagious – three kids showed up at my door today asking to be let into the club). It’s reached a point where the program nearly runs itself. Without the pressure of a tournament approaching, I’m taking a laissez-faire attitude towards students who just want to build stuff out of LEGOs (see photo). Now that we’ve mostly worked out our laptop difficulties – it was touch-and-go for a while – most of the kids are actively engaged. We’ve settled into a routine; they spend a few minutes at the start chatting and eating snack, if someone brings one, and I take attendance and sit down for 10 minutes. 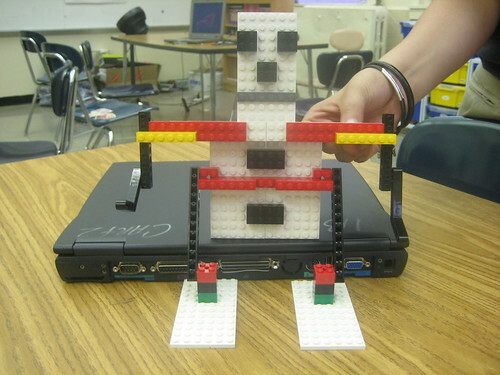 Then I propose the day’s challenge, and the teams take out the LEGOs and get to work. Today, all the kids were raring to go, it was striking how eager they were to dig in on a new challenge: to score a “field goal” by catapulting a ball through goal posts I created in honor of the Super Bowl. Once they get started, I do nearly nothing. I sit nearby and observe, do some work if I’m under a lot of pressure, help out when they need it, but mostly just watch and listen. Occasionally I point something out that they should consider, or make a suggestion… but mostly, I let them explore and teach themselves and each other. Today it seemed obvious that we’ve made some real breakthroughs in the last few months since the tournament ended. Once, if I asked them to do something involving a robotic arm, it would have taken several weeks and many poorly-designed attempts. They didn’t have much intuition regarding engineering or how to accomplish tasks with the specific types of pieces available. Now, without any explicit teaching on my part, they just set to work and a few minutes later, a catapult has been built, complete with a bar for the arm to hit against when it snaps forward, and, at the other table, a robotic arm featuring a scoop-like claw, which is quickly modified when it turns out that the ball falls out of the claw. I suppose I could hasten the pace by presenting stuff about gears and other aspects of engineering, but I like this way better. Anything I could do would seem sort of abstract and out-of-context; now they are learning in, to use some seriously nerdy ed-psych jargon, their zone of proximal development. One day’s accomplishment is the foundation for the next, solutions are considered, tested, rejected or improved upon or accepted, ideas are even discussed and weighed against one another. Neither group’s catapult scored the field goal today, in part because I made them throw from so far from the goal that it might be a nearly impossible challenge. Thursday I’ll ask them if they want to continue as is, move the throwing line forward a bit and keep going with new conditions, or move on to a new challenge. Both groups improved their designs significantly over the course of the day so in my mind, the real challenge has been accomplished. But investment requires closure, so if they want to see the ball fly through the goal posts, they should keep at it.